Please have your child read for at least 30 minutes. I sent home new reading logs last week just in case we got more snow. Looks like things should be back to normal tomorrow. Please check to see if your child’s math teacher sent home snow day math homework. 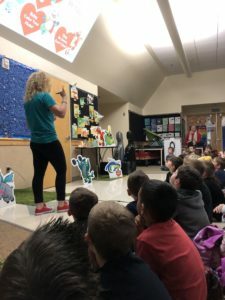 This month, grade school students are pledging to be healthy! We’re pledging to daily: be physically active for 60 minutes, do a good deed and choose water over sugary beverages. In addition, students will be learning jump rope skills during PE time. 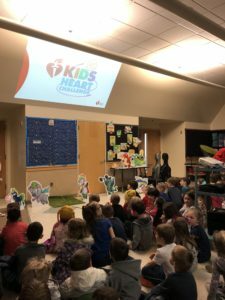 In backpacks Thursday were flyers detailing this initiative, as well as information for students to raise money for the American Heart Association. Participation is, of course, voluntary. Our main focus is to have healthy hearts. A note on fundraising: If we reach our school goal of raising $1500, we’ll get some new PE equipment donated! Click here to learn more. Search “Corbett Elementary” to register! If students choose to raise money, there are some thank you gifts. These will be distributed by our PTA volunteers, at a table right inside the entrance hallway on the next three Thursday mornings (2/14, 2/21, 2/28). Here’s Hannah leading the K/1 through an assembly!